The high-gambrel roof style on Lexington Storage Shed by Arrow gives you plenty of storage. Give your garage back to your car and organize lawn and garden equipment, patio furniture and much more in the durable Lexington. 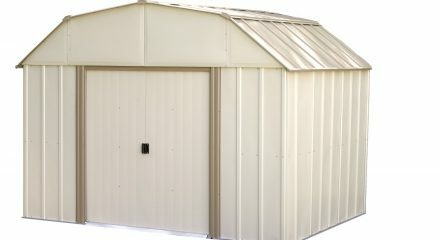 It has a baked-on enamel finish and an interior height of over 7 feet tall – The Lexington Storage Shed is a great value.